Life with Lesley: Enter to WIN Boogie Wipes for your Classroom & I've Got A Giveaway for YOU! 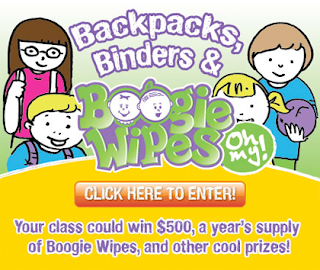 Enter to WIN Boogie Wipes for your Classroom & I've Got A Giveaway for YOU! Boogie Wipes is looking for 3 "Boogietastic" classrooms to receive some awesome cash prizes, Boogie Wipes and more! For more information on the contest and to submit an entry, please visit the Boogie Wipes Facebook page. Contest ends Sept. 30th so get your entries in now! But wait, don't leave just yet...I've got more! I am also giving away 2 packs of Boogie Wipes, samples and some valuable coupons to one of my lucky readers! I have not entered yet but I love how soft they are on my daughters' noses!